Sales guidance and dividend/buyback plans will be at the top of investors' minds as the tech giant reports. A few other things are also worth paying attention to. Apple's (AAPL - Get Report) shares certainly haven't been unscathed as one chip supplier after another has offered bleak commentary about near-term smartphone demand. And even before this selloff, shares were trading at pretty subdued multiples. For that reason, expectations are far from high as Tim Cook's company gets set to release its March quarter (fiscal second quarter) report at 4:30 p.m. ET on Tuesday. On average, analysts polled by FactSet expect revenue of $61.24 billion (up 16% annually) and GAAP EPS of $2.69 (up 28%). Given all of the supplier commentary and research reports pointing to soft near-term iPhone demand, Apple's June quarter revenue guidance will likely have a bigger impact on how its stock moves post-earnings than its March quarter results. For now, the consensus is for revenue of $51.9 billion (up 14% annually); it's worth noting that this consensus has dropped by $1 billion since early March, and by nearly $5 billion since the start of the year. On Apple's last earnings call, CFO Luca Maestri promised that his company would announce changes to its capital return program at the time its March quarter report is released. Apple usually does that, but it's safe to say that larger-than-normal capital return increases are expected this time around. In January, Apple committed to repatriating $207 billion in cash ($245 billion pre-tax) thanks to tax reform. And a couple weeks later, Maestri said Apple, which had $163 billion in net cash as of Dec. 30 and will now be able to repatriate future offshore profits at a fairly low tax rate, aims to become "net cash neutral over time." All of that sets the stage for a major increase to Apple's buyback authorization, and perhaps also a sizable dividend hike. Like quite a few U.S.-based multinationals in other industries, many tech giants got a big first-quarter revenue boost from a weak dollar. Microsoft's (MSFT - Get Report) revenue rose 16% in dollars and 13% in constant currency (CC). Facebook's (FB - Get Report) rose 49% in dollars and 42% in CC. It's safe to assume that Apple, which got 65% of its December quarter revenue from international markets, is also getting a large near-term lift from forex trends. Look for analysts to ask the company, which doesn't always share precise figures about the impact currency swings are having on its top line, about just how much of a forex lift it got in the March quarter, and how large of one it expects in the June quarter. The iPhone is once more expected to account for over 60% of Apple's revenue in the March quarter. Due to both low expectations and the fact that (after seeing the opposite happen in the December quarter) Apple's iPhone shipments are expected to trail sales to end-users, the consensus is for iPhone unit sales to rise by just 2 million annually to 53 million. On the other hand, a weak dollar and the iPhone X's steep pricing is expected to help Apple's iPhone average selling price (ASP) rise by $87 to $742. In the December quarter (a seasonally strong one for ASPs due to new iPhone launches), iPhone ASP rose by $102 to $796. ASP strength could dampen the impact of any March or June quarter iPhone unit weakness. Reported and expected gross margins. 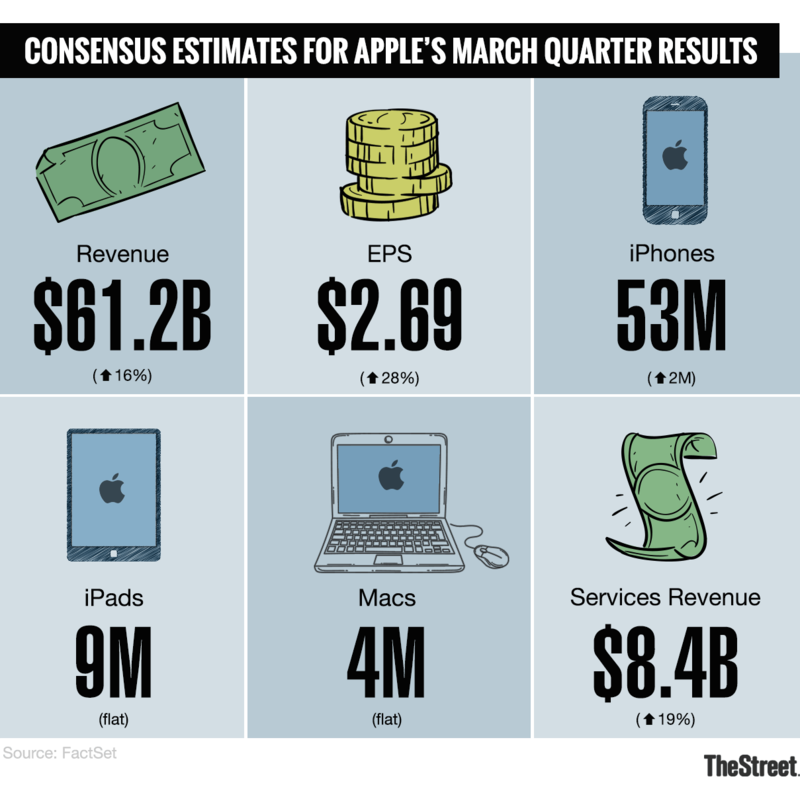 Apple guided three months ago for a March quarter gross margin (GM) of 38% to 38.5%, slightly below a year-ago GM of 38.9%. For the June quarter, consensus is for GM to rise fractionally to 38.6%. A recent slide in NAND flash memory prices (they rose over much of 2017) could provide Apple with a margin boost, as might improved iPhone X manufacturing efficiencies. On the other hand, DRAM prices remain high and soft iPhone unit volumes could also act as a margin headwind. Services and Other Products segment growth. As iPhone, iPad and Mac sales have fluctuated, Apple has been able to count on strong Services revenue growth -- App Store transaction growth, Apple Music's rapid uptake and iCloud storage subscription growth have all provided a lift, and so have higher search ad revenue-sharing payments from Alphabet/Google (GOOGL - Get Report) . Likewise, Apple's "Other Products" revenue has come on strong in recent quarters, thanks in large part to Apple Watch and AirPods momentum. Consensus is for Services revenue to rise 19% in the March quarter to $8.4 billion, and for Other Products revenue to rise 28% to $3.7 billion. Given forex trends, Apple Music's momentum and Google's traffic acquisition cost (TAC) growth, the Services consensus looks fairly beatable. Meanwhile, the HomePod's February launch presumably gave a lift to last quarter's Other Products revenue. On Friday, CNET reported that Apple is prepping an AR/VR headset for 2020 sporting a pair of display panels that each carry 8K resolutions (that's no typo). With a lot of horsepower needed to do things show videos and play games on a pair of 8K displays, Apple's headset will reportedly rely on an external box (paired via short-range wireless links) for processing power, and thus appears to be meant for indoor use. The report follows one from Bloomberg in November that also stated an Apple AR headset could launch in 2020. As usual, don't expect Apple to directly comment on its plans for future products. But it could share a thought or two about how it sees the AR/VR headset market evolving, and what technical challenges need to be addressed. Jim Cramer and the Action Alerts PLUS team hold positions in Apple, Microsoft, Facebook and Alphabet for their Action Alerts PLUS Charitable Trust Portfolio. Want to be alerted before Cramer buys or sells AAPL, MSFT, FB or GOOGL? Learn more now. This column originally appeared on Real Money, our premium site for active investors. Click here to get more great columns like this.